Station Renovation Includes Installation of Two New Elevators. Queens, NY - October 30th, 2013 - MTA Long Island Rail Road President Helena E. Williams and Assemblywoman Barbara Clark today unveiled the newly renovated and enhanced Queens Village LIRR Station. As a part of the project, workers have installed two new heavy duty elevators, one each serving the eastbound and westbound platforms. The new elevators are aesthetically integrated into the historic station building and platforms. Workers have also repainted the entire station building and added new signage and a new fire alarm system. The platform waiting room has been rehabilitated, and numerous improvements have been made throughout the complex, including replacement of platform railings, a new shelter shed, replacement of platform lighting, bird abatement devices, drainage and erosion control, and security cameras. “This project is part of the LIRR’s overall strategy to improve access to our stations in Southeast Queens,” Williams said. “The two new elevators will make it much easier for customers to reach the platform level for service East and West, especially those customers with mobility challenges. Though Queens Village has been a stop on the LIRR since 1881, the current station building was opened in 1924 in conjunction with a project that elevated this section of track above street level. The current renovations and enhancements were completed for $8.5 million. The LIRR is also moving forward on a plan to install new elevators at the LIRR’s Flushing station. 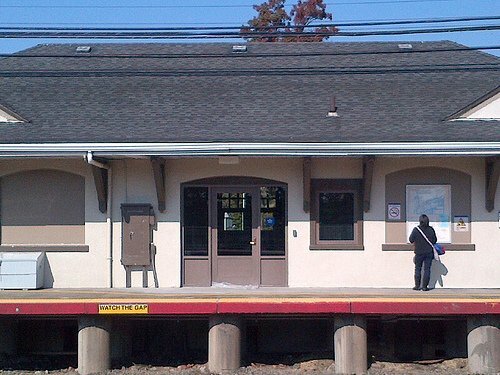 In addition, the LIRR installed a new elevator at the Rosedale Station in 2008. Photo Courtesy of the MTA's official Flickr Page. Subject: LongIsland.com - Your Name sent you Article details of "MTA Long Island Rail Road Unveils Restored Queens Village Station"